Making the most out of the property you have surrounding your home is a way to add value to your property while also providing more opportunity for entertainment and relaxation. Get creative with backyard improvement ideas to help you and your family enjoy your yard all-year-round, regardless of the season. Take advantage of enjoying your hot tub throughout the entire year with hot tub enclosures in place. Use an enclosure to build a room that can be closed when it is raining or becoming too cold to sit outdoors. Hot tub enclosures are ideal to keep warmth inside of the area while also providing the opportunity to open up the room at any time. Keeping a TV outdoors throughout every season is not always possible, especially if you live anywhere that receives storms or the changing of the seasons. Building outdoor TV enclosures is one way to enjoy entertainment outside all-year-round without worrying about the actual outdoor temperature. Roll up shutters are available to fit any household’s exterior design as well as any weatherproofing features that are necessary. Weatherproofing roller shutters is ideal if you live in an area with a fluctuating and unpredictable climate. Create a pool house or a tropical cabana area outside of your home when using a cabana roll up or roll-up shutters. Serve drinks, food, and listen to music with a cabana roll up installed and in place. A cabana roll up is the perfect solution for homes located in areas with a moderate and predictable climate. Create the cabana area of your dreams with pool and cabana enclosures. 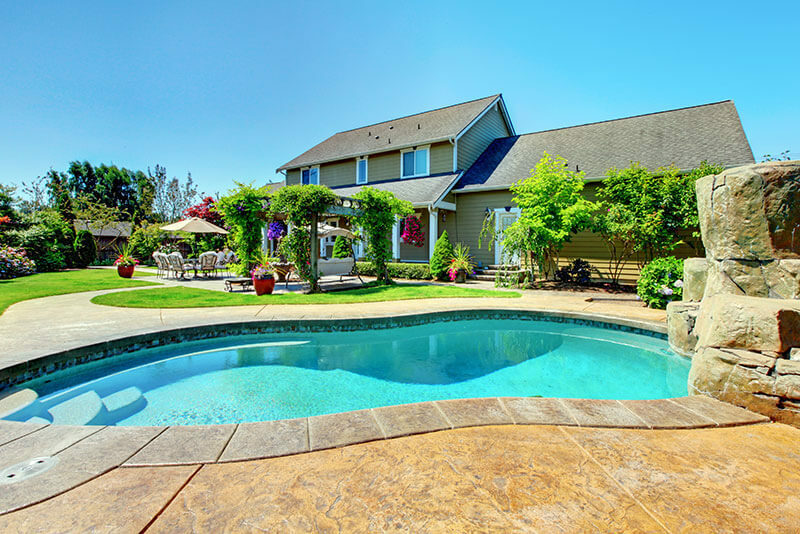 When you want to keep your outdoor pool outside but you are interested in expanding the living space you have available outside, consider installing an enclosure around your pool’s deck. Creating an enclosure that surrounds your pool deck is a great way to make the most out of your outdoor living space even during months which your pool is closed for cold and icy temperatures. An enclosed pool deck provides you with additional opportunities to add heaters and cooling devices throughout the space for maximum comfort. 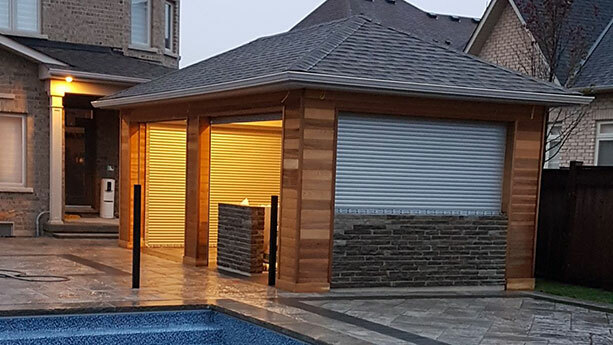 Once the summer arrives again, open the shutters and enclosure using automatic roll-up solutions that make utilizing all of your outdoor space a breeze any time of the year. If you simply cannot get enough of the beach during the summertime, consider creating your very own backyard sand oasis. Enclose your sand oasis using roll up shutters or cabana roll-up solutions. Create a large sand pit and implement a fire pit for cooler months. Use your enclosure to provide you with a weatherproofed environment, perfect for listening to music or catching up on favorite television shows outdoors. Once you have an enclosed environment, implement decorative seating, decor, and even outdoor rugs. Use tropical plants and create an indoor garden or greenhouse if possible depending on your surrounding climate. Create a comfortable environment with roller shutters that also help to maintain heat and cool air throughout the summer and winter months. Designing a reading room with a fire place or a glass structure using an enclosure system is optimal for anyone who enjoys reading, writing, and spending time in all of the seasons. Creating a reading room with roller shutters or cabana roll-ups along with glass walls or enclosures is a way to spend more time in seasons which are too cold or warm while remaining comfortable inside. Decorate your backyard reading room with bookshelves, tables, seating, and comfortable decor to make the most out of the time you spend overlooking the outdoors from your yard. Adding a fire pit into your backyard is one of the best improvement ideas to help you make the most out of each season throughout the year. Fire pits are affordable and provide warmth, a method to cook, and a place to spend time with family and friends as the months become colder. Purchase a fire pit or build your own in your backyard by digging deep into the ground or creating a foundation for a raised fire pit. Consider adding stones, blocks, and other patio features to surround your fire pit or to provide a walkway for guests. Build the outdoor kitchen of your dreams with roll-up shutters and outdoor kitchen shutters. Outdoor kitchen shutters are designed to withstand weather of all types and also come waterproofed for homes that experience heavy precipitation. Using outdoor kitchen shutters allows you to create and build the fully-functional kitchen of your dreams outdoors for family and friends to enjoy year-round. With roll-up shutters, open and close your working kitchen when the weather turns or when you are heading in for the evening. With a custom outdoor kitchen using automated roll-up shutters, drastically increase the overall value of your home and property. Outdoor kitchens that are usable throughout the year also add to the overall appeal to any home or piece of property. Even if you do not install a complete and full outdoor kitchen, it is still possible to put roll-up shutters to use when creating a patio area with standard outdoor grills and accessories. Having an enclosure on your patio or deck is a great way to add value to your property while providing additional living space for your entire family. Roll-up shutters provide weatherproofing and the ability to enjoy the outdoors in just about all weather conditions. Using roll-up shutters allows you to open up outdoor rooms or keep them closed to fit desired temperatures and atmospheres. Some roll-up shutters are controlled using remotes and devices such as smartphones or tablets, providing you with maximum control when managing your shutters from any location. Opening and closing outdoor roll-up shutters is now easier than ever with automation features available in most standard options on the market. Before you begin shopping for roll-up shutters that are right for your backyard, there are a few questions to ask yourself before moving forward with your purchase. Are you in search of roll-up shutters that are weatherproof or that offer weatherproofed options? When will your enclosed area be used the most and in what type of weather? Do you require a backup system installed with your new roll-up shutters? How frequently will your shutters be opened and closed? Are you in need of a specific design, color, or material when purchasing your roll-up shutters? Browse materials and sizes of roll-up shutter solutions that are appealing to you. Consider the exterior material of your home currently before choosing the color, material, and style of the shutters that work best with your property. Compare pricing of traditional roll-up shutters as well as those that offer automation features to access and manage your shutters using your phone or other computer devices. When you have an understanding of the shutters you require to complete your backyard improvement project, it is much easier to obtain the materials you need to get started. Learn more about roll-up shutters and which types are best for the yard project you have in mind before investing in a solution that is right for you. Design the backyard of your dreams with roll up shutters and a bit of creativity. Using a roll up shutter solution is a way for you to bring any vision you have for your backyard to fruition.